Photographs and text by Lucas Foglia. Nazraeli Press, Paso Robles, CA, USA, 2017. 92 pp., 58 four-color illustrations, 12½x9½x¾". 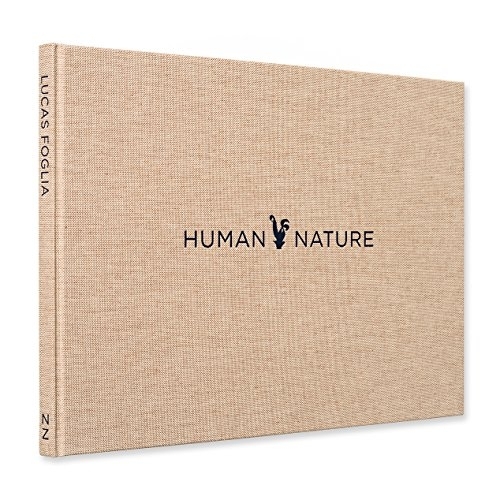 Nazraeli Press is delighted to present Human Nature, our third monograph by American photographer Lucas Foglia. Human Nature begins and ends with interpretations of paradise. The narrative of the book unfolds through sequences of photographs - moving through cities, forests, farms, deserts, ice fields, and oceans. Along the way, scientists work to quantify and understand our relationship with the natural world, measuring how we change nature and how spending time in wild spaces changes us. Both factual and lyrical, the series is a celebration of the curious. At times funny, sad or sensual, the images illuminate the human need to connect with nature and to the wildness in ourselves. Foglia's work is driven by a desire to understand the conflicting forces of modernity and nature; how we manipulate the earth to sap its resources, and how some seek to restore it. Human Nature revisits themes established in previous books A Natural Order and Frontcountry, but on a broader, global scale. Lucas Foglia's photographs are held in major collections in Europe and in the United States, including Art Collection Deutsche Börse, Denver Art Museum, Foam, International Center of Photography, Museum of Contemporary Photography, Museum of Fine Arts Houston, Victoria and Albert Museum, Philadelphia Museum of Art, Pier 24, Portland Art Museum, and San Francisco Museum of Modern Art.